New terror organizations are being established by the U.S. at the Tanf military base in southern Syria that is run by Washington, where a number of armed groups are being trained in order to be used as a pretext to justify U.S. presence in the war-torn country. Fingers are being pointed at the U.S. after four Russian soldiers were killed in Syria’s Deir Ezzor province, as it is being claimed that Daesh and armed groups, which are being labeled as “moderate opposition” and trained at the U.S. training base in the Tanf region, are behind the attack. The attack was carried out by a kamikaze bomb-laden combat drone and aimed to open a rift between Ankara and Moscow by blaming the Turkey-backed Syrian opposition for the incident. However, Russia had ruled out that the Free Syrian Army (FSA) is capable of mounting such a sophisticated attack. 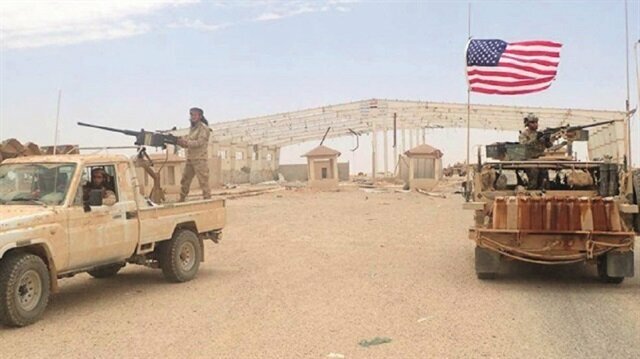 The base in al-Tanf, which has recently been attracting attention, is seen as the center of new terrorist structures planned to be the pretext for the U.S. to remain in Syria, after Washington legitimized its presence in Iraq under the pretext of the Daesh terror group. The Tanf region and the Golan Heights are the two last major opposition strongholds in southern Syria along with a small area to the southeast. The People’s Protection Units (YPG) will withdraw from Syria’s Manbij in line with early meetings between Turkey and the U.S., and Turkey will monitor the region, Foreign Minister Mevlüt Çavuşoğlu said on Wednesday.“If we can successfully actualize this, we may implement the same thing across northern Syria. The calendar will be determined on June 4. I believe the U.S. wants to sever its ties from the YPG/PKK,” Çavuşoğlu said.Last week, Turkish and U.S. working groups, who met in Ankara, said they had outlined a draft for cooperation to ensure security and stability in Manbij.The YPG is the armed wing of the Democratic Union Party (PYD), which is the Syrian offshoot of the Kurdistan Worker’s Party (PKK). The U.S. has largely ignored the PYD/YPG links to the PKK, which the U.S., EU, and Turkey list as a terrorist group.US denies reaching agreement with Turkey on ManbijF-35 fighter jetsTurkey will meet its needs elsewhere if the United States bars it from purchasing Lockheed Martin's F-35 jets, Çavuşoğlu said. "The pre-payments for this project have been made. This is a comprehensive agreement. It's not just purchasing, but also joint production," he added during a return flight from a visit to Germany.Turkey has plans to buy more than 100 of the F-35 jets and last year the Pentagon last year awarded Lockheed $3.7 billion in an interim payment for the production of 50 of the aircraft earmarked for non-U.S. customers, including Ankara.A U.S. Senate committee last week passed its version of a $716 billion defense policy bill, including a measure to prevent Turkey from purchasing the jets, further straining already tense relations between the NATO allies.Turkey says will retaliate if US halts F-35 salesTurkey-U.S. tiesThe foreign minister added that Turkey’s Incirlik Base would only be shut down if ties with the U.S. came to a breaking point. Incirlik Base is a strategic military facility in Turkey’s southern Adana province.Çavuşoğlu also announced that Turkey's ambassador to Washington, who had been recalled for consultations after Israeli forces killed Palestinian protesters in Gaza earlier this month, would return to Washington. The U.S. doesn’t have any agreements yet with Turkey on Manbij, northern Syria, the State Department said Tuesday.“We don't have any agreements yet with the government of Turkey. We announced previously that the United States and the Turkish working group met...in Ankara on Friday of last week,” State Department spokesperson Heather Nauert said during a daily press briefing.“We're continuing to have ongoing conversations regarding Syria and other issues of mutual concern. The two sides then had outlined the contours of a road map for further cooperation, and that includes on Manbij.”Following a visit by former U.S. Secretary of State Rex Tillerson to Ankara in February, Turkey and the U.S. established a mechanism to address separate issues in working groups, including the stabilization of Manbij and to prevent any undesirable clashes.PKK terrorist on most wanted list killed in east TurkeyPKK terror attack martyrs Turkish soldier in N. IraqNauert also said that Secretary of State Mike Pompeo and Turkish Foreign Minister Mevlut Cavusoglu are set to meet in Washington on June 4.The first meeting of the working group on Syria was held on March 8-9 in Washington.U.S. military support for the YPG/PKK terrorist group in Manbij has strained ties between Ankara and Washington and has led to fears of military clashes between the two NATO allies, since there are roughly 2,000 U.S. troops in the city.In January, Turkey launched Operation Olive Branch in Afrin, northern Syria to clear terrorist groups from the area. After liberating the city of Afrin, Ankara said it might also extend its operation further east to Manbij unless the YPG/PKK terrorist group leaves the strategically located city. Apart from the so-called opposition that is linked to al-Qaeda, Daesh terrorists brought from Raqqa, western Deir Ezzor and the Golan Heights are being trained in the Tanf camp. The Tanf region carries strategic importance for the U.S.-UK-Israel alliance’s plans in Syria. The new line for PKK terror corridor, which was foiled by Turkey's Euphrates Shield and Olive Branch operations in northern Syria, is being evaluated as being along the borders of Israel and Jordan through Deir Ezzor and Tanf. The plan is to transport Iraqi oil to the Haifa Port on the Mediterranean through Deir Ezzor and Tanf. After Turkey’s Operation Olive Branch blocked the northern corridor, the Pentagon has put Plan B into action by training terrorists in the Tanf base in order to mobilize new terror elements for the establishment of a southern corridor. Plans to shift the Syrian war to the south have become more pronounced after the missile strike that the U.S. carried out in coordination with Britain and France. Turkish security forces killed a wanted PKK terrorist during a counter-terrorism operation in Tunceli province, local officials said Tuesday.Gendarmerie forces launched an operation in a rural area of Hozat District and killed the terrorist following a clash with members of the terrorist group, the Tunceli governor’s office said in a statement.The wanted terrorist was identified as Mustafa Seker, codenamed Berhudar-Genco.Seker was mentioned in the grey category of the Interior Ministry's list of wanted terrorists, said the statement.The wanted list is divided into five color-coded categories, with red as the most wanted followed by blue, green, orange and grey.PKK terror attack martyrs Turkish soldier in N. IraqIn its more than 30-year terror campaign against Turkey, the PKK -- listed as a terrorist organization by Turkey, the U.S. and the EU -- has been responsible for the deaths of some 40,000 people, including women and children.